Situated in Coaldale Cutty's Hayden Creek Resort - A Cruise Inn Park features accommodation with free WiFi. There is also a kitchenette in some of the units equipped with a microwave and stovetop. The campsite offers an outdoor pool. BBQ facilities can be found at the property along with a shared lounge. 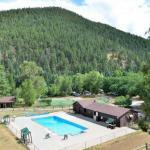 Salida is 28 km from Cutty's Hayden Creek Resort.